Linda Wallander is bored. Just graduated from the police academy, she is waiting to start work at the Ystad police station and move into her own apartment. In the meantime, she is staying with her father and, like fathers and daughters everywhere, they are driving one another crazy. Nor will they be able to escape each other when she moves out: her father is Inspector Kurt Wallander, a veteran of the Ystad police force, and the two of them will soon be reluctant colleagues. Linda’s boredom doesn’t last long. Soon she is deeply involved in the inexplicable disappearance of her childhood friend, Anna. But no one—least of all her father, who is busy investigating an ominous series of animal killings—thinks anything serious has happened to Anna. Determined to find out the truth, Linda makes a few predictable rookie mistakes that may just turn out be life-threatening. When her father’s case unexpectedly dovetails with Anna’s disappearance, something far more calculated and dangerous than either could have imagined begins to emerge. Joining their efforts is Stefan Lindman (The Return of the Dancing Master), a recent transfer to the Ystad station. 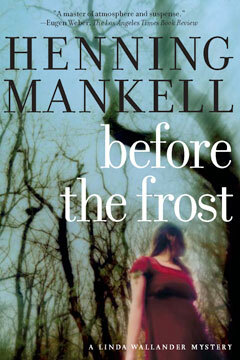 Already an international bestseller, Before the Frost brings us a new heroine in Linda Wallander, the next generation of proud, stubborn, and talented detectives and possibly Henning Mankell’s most compelling character.